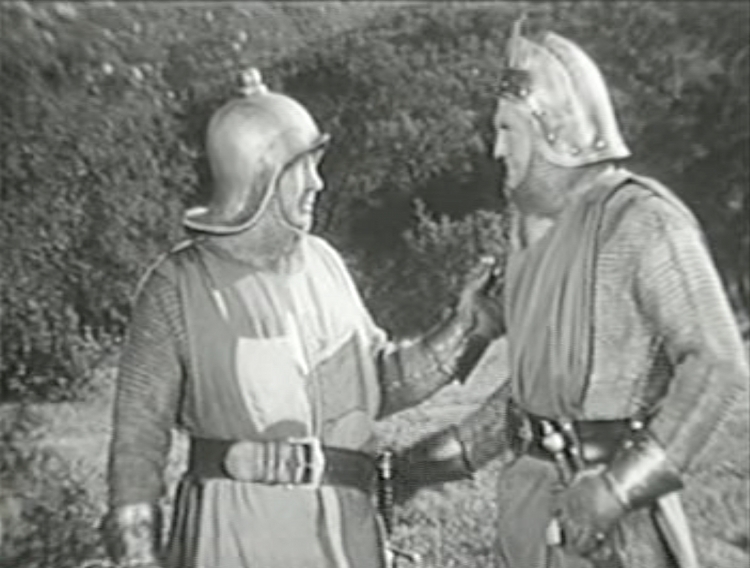 After a friendly joust between Camelot and Cornwall, an unknown knight rides forward and challenges the victors, Sir Bors and Sir Modred of Camelot. After defeating them, the stranger requests to be made one of King Arthur’s knights, and reveals that his name is Galahad. Impressed by the young knight’s skills and candor, Arthur agrees to put Galahad to the traditional test: he must stand guard over the sword Excalibur through the night. 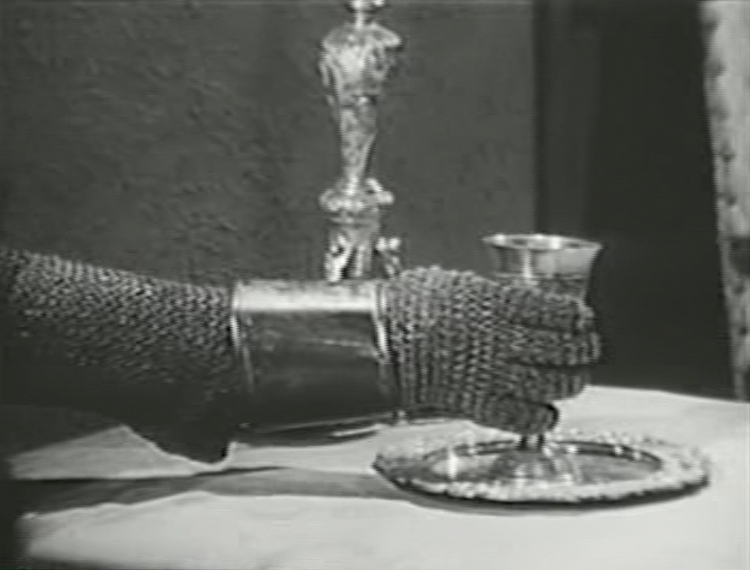 Through treachery and drugged wine, however, Galahad passes out, but not before seeing a suit of armor move! 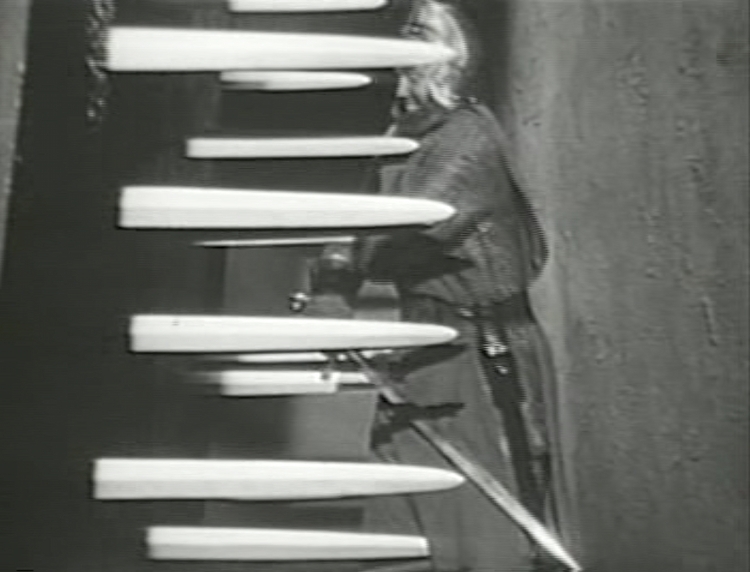 The mysterious armored knight takes the sword and escapes the castle through a secret passage. The next morning, Galahad is discovered asleep. No one believes his wild story, and Merlin himself accuses Galahad of perpetrating the theft. Even worse, the invading Saxons, led by King Ulric, are attacking! While Arthur defers punishment and Galahad is allowed to ride with the knights, he vows to find the sword and return it to Arthur to clear his name and earn his place at the Round Table. 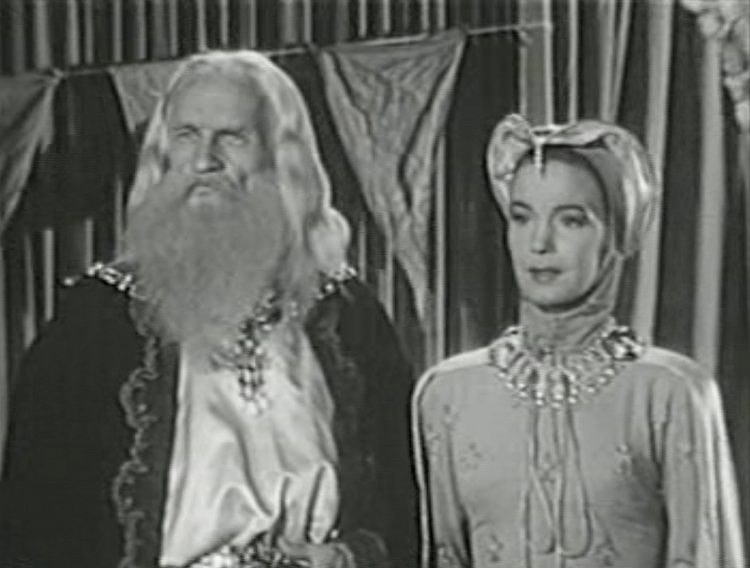 Thus begins the twisting plot of The Adventures of Sir Galahad, the 1949 serial from veteran director Spencer Bennet. Along with Sir Bors (also under suspicion because it was he who served the wine that incapacitated Galahad), Galahad infiltrates the Saxon camp, fights against outlaws, and must even overcome Merlin’s magic, all while trying to win over the suspicious knights of Camelot. Ultimately, the villain is the “Black Knight,” the traitor within Camelot who seeks to manipulate the Saxons and outlaws into defeating Arthur in order to claim the throne for himself. He who wields the invincible Excalibur can stand against any foe, so of course the Black Knight keeps it for himself, even while pretending to aid Ulric. The legends and romances that make up the Arthurian cycle are so rich and varied that film adaptations inevitably borrow what can be used and discard the rest. Often the forbidden romance between Sir Lancelot and Queen Guinevere is featured, and the quest for the Holy Grail is another popular subject for film, tackled by both Monty Python and John Boorman. In some versions of the story, Galahad is Lancelot’s son, determined to prove himself before he reveals his identity to his father. 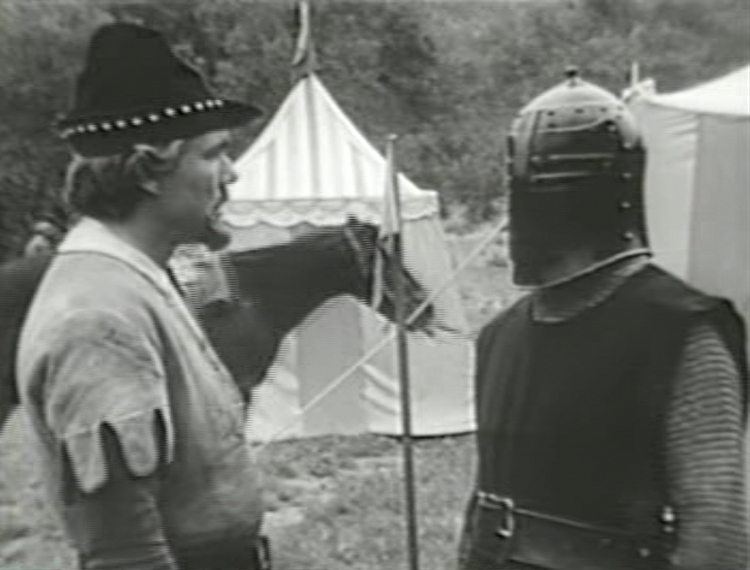 The Adventures of Sir Galahad doesn’t deal with any of those plots, but it does an impressive job of creating an original story, combining the source material with the formal demands of a serial. In fact, The Adventures of Sir Galahad is unusual in its choice of setting: there are very few serials that deal with medieval or mythological settings (but see Jerry Blake’s comments below). 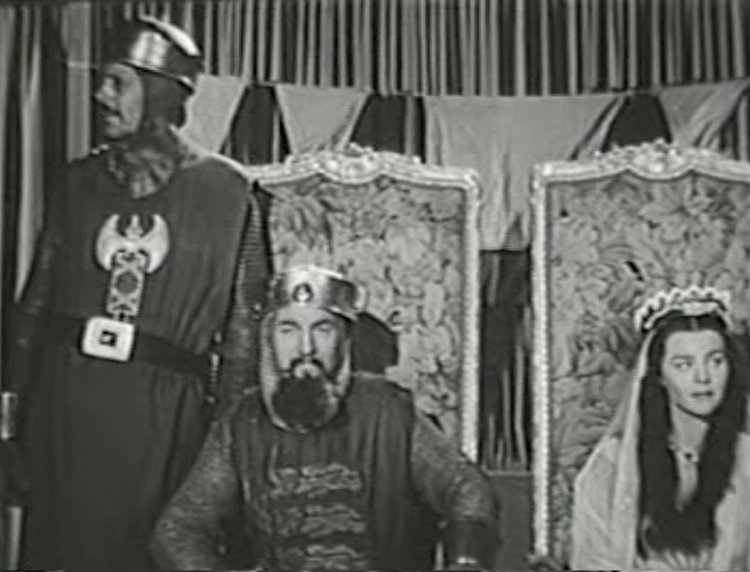 Film studios were regularly releasing features about Arthur, Robin Hood, and other legendary figures, so sets and costumes would have been available for serials (Columbia’s The Green Archer features a castle and a Robin Hood-like character, but is set in modern times), but Galahad remained an outlier. It’s largely a successful hybrid, however: the struggle of the knight and his partner to solve the mystery and prove his innocence lends itself to the episodic rhythm of a serial; there are plenty of opportunities for fight scenes, both skirmishes and full-on battles, and the abundant swordplay makes a nice change from fistfights and shoot-outs; the disguised villain is very typical, comparable to such bad guys as the Scorpion or the Dragon (it ends up being exactly who you think it is, but still); and the frequent magical interference of Merlin (as well as Morgan le Fay, who has a few spells of her own) provide opportunities for unusual and inventive special effects and camera tricks. To cite just one example of the serial and fantasy worlds colliding, the cliffhanger of Chapter Eight (“Perilous Adventure”) features Galahad and an outlaw fighting in a wagon pulled by a runaway horse. 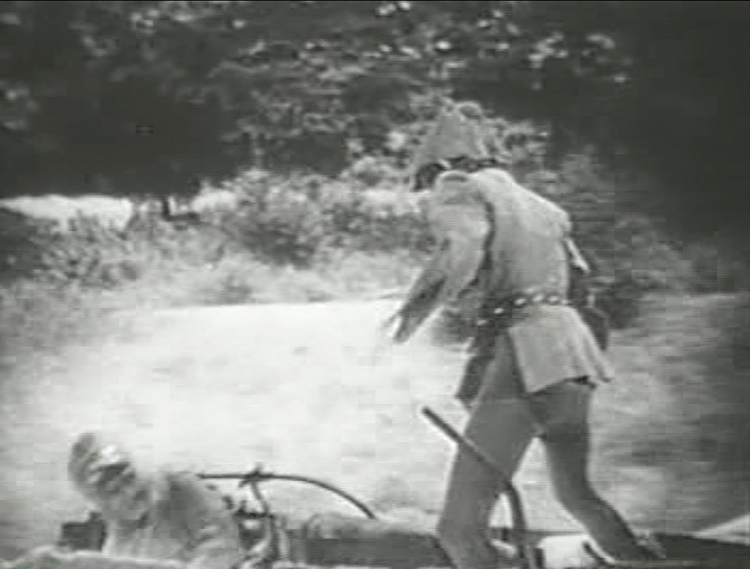 The scene is identical in blocking and editing to similar fights atop trains or trucks in other serials, down to the use of rear projection, but the medieval setting puts it into a novel context. 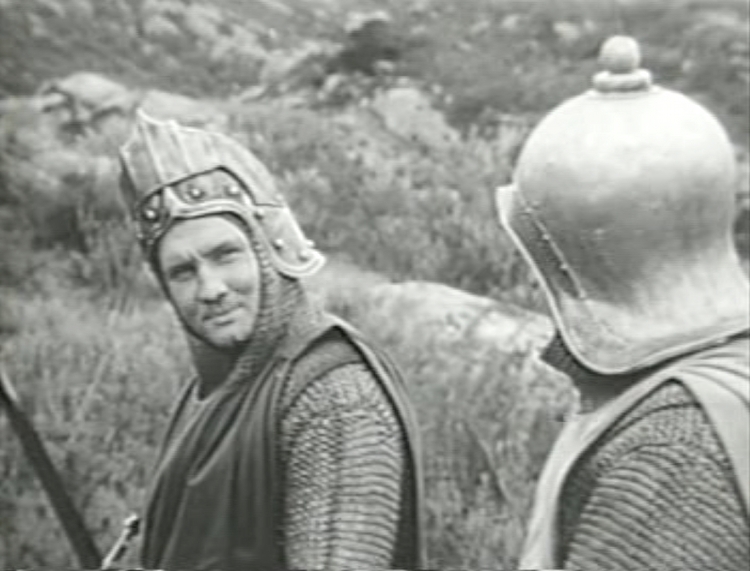 From a story perspective, writers George Plympton, Lewis Clay, and David Mathews also make some smart decisions: by setting Galahad against Merlin and the knights of Camelot at the beginning, the story upends expectations about good guys and bad guys: like Galahad, the audience is unsure who to trust. Merlin appears to be the villain at first; Morgan le Fay offers her own magical help, but what’s her agenda? Arthur (Nelson Leigh, seventh billed) is a distant figure, far from the center of the story. 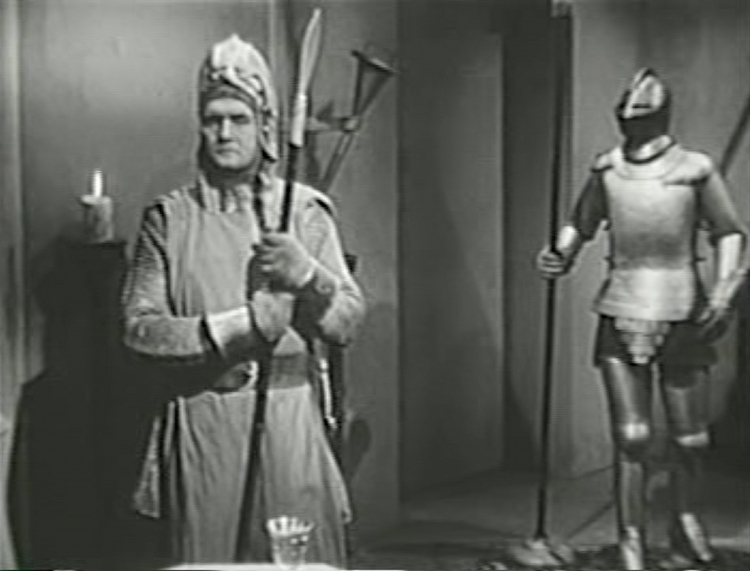 Galahad is left to his own resources, with only the dogged Sir Bors (Charles King) to provide both comic relief and the occasional voice of reason. If these versions of the characters ultimately conform to our expectations of them, it’s not without enough twists and turns to make them feel lived-in, the resolution to the story earned. 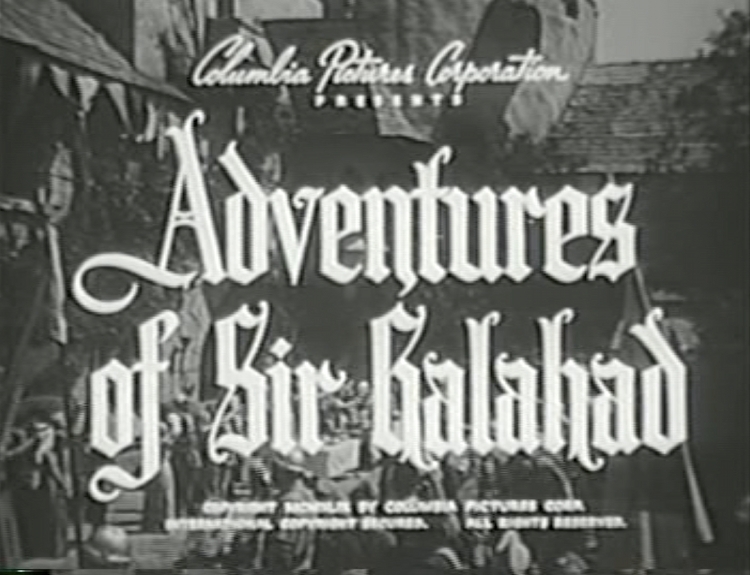 The Adventures of Sir Galahad boasts a large cast for a serial, but the difference between serial and feature shows in the battle scenes, where one might expect hordes of extras: a dozen men on horseback is large enough to make a convincing posse or Indian war party in a Western, but when such a group is meant to represent the entire Saxon army, it’s a little puny. 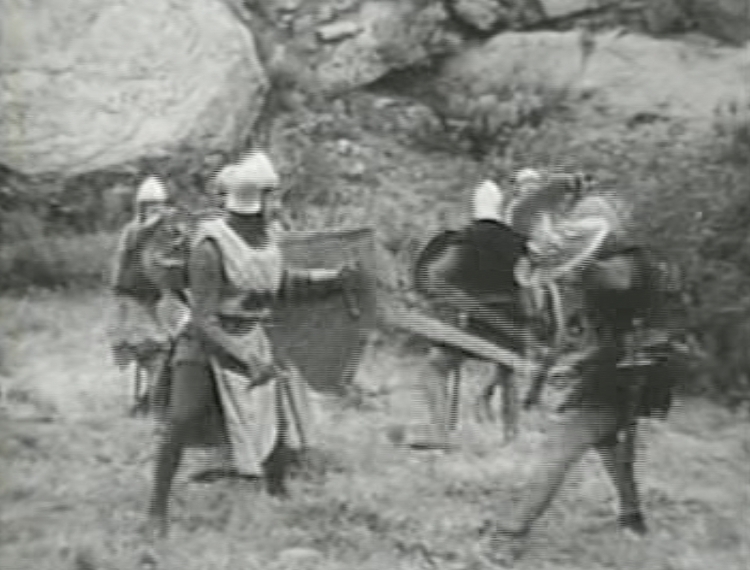 Galahad‘s fight scenes are more impressive when staged in close quarters (such as several fights that take place in an inn, or in mountainous terrain), hiding the small number of men involved and making the fight look more crowded. 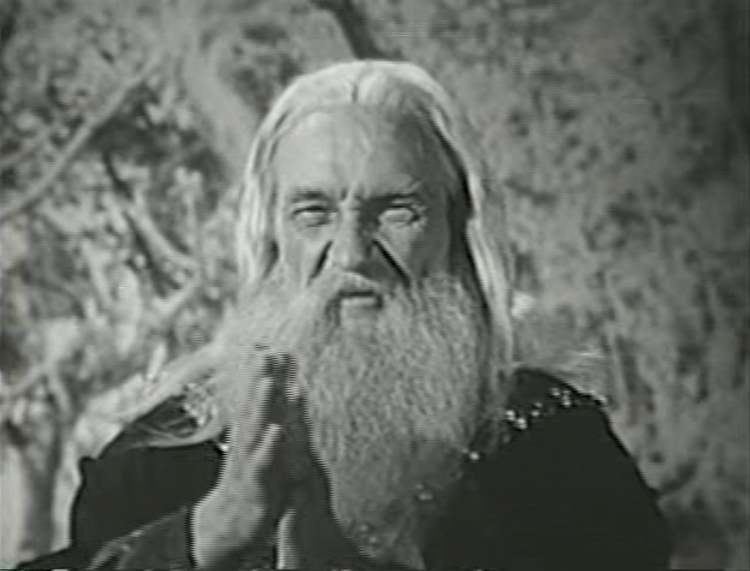 In many ways, The Adventures of Sir Galahad bears a close resemblance to the low-budget fantasy features that would become popular in the 1950s, such as Bert I. Gordon’s The Magic Sword or the many films about Hercules or Sinbad. As Galahad, George Reeves (who would go on to play Superman on TV) makes a convincing hero, eager and brave, but at 35 he is more boyish (at one point a discouraged Bors calls him a puppy, “barking at nothing and chasing his own tail”) than boy (apparently a common pitfall in serial casting). Charles King plays Bors as an over-the-hill Falstaff, accustomed to big meals and the wenches who serve them, but he also becomes Galahad’s most loyal companion and, like all the knights of Camelot, will do what must be done to combat evil. The MVP of the cast is William Fawcett, who plays Merlin. Fawcett was the crotchety scientist Professor Hamill in Batman and Robin; he’s just as crotchety here, but with the robes and long white beard of a wizard. He’s clearly having a ball chewing the scenery, throwing flash grenades to mask his magical comings and goings, and waving his hands to cast spells. It’s no wonder Fawcett had such a long career: he’s the quintessential character actor, breathing life into a stock character and stealing every scene he’s in. If I could add one thing to this serial, it would be to have Galahad fight a dragon; the only monsters the knight faces are ultimately human ones. Other than that omission, there’s as much Dark Ages atmosphere as you could hope for in The Adventures of Sir Galahad, with secret passages and dungeons, sword fights, magic spells, and mighty feasts. 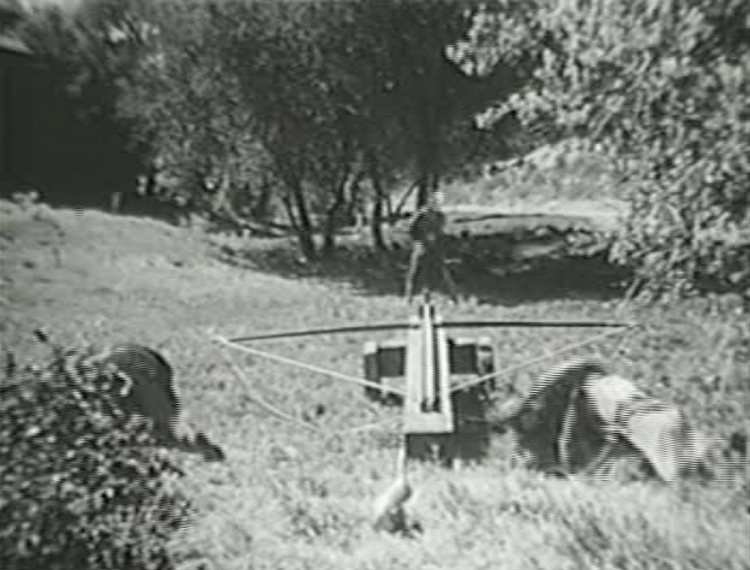 There is even a giant crossbow! The Adventures of Sir Galahad is highly recommended to both serial and fantasy fans. Where I Watched It: I bought a batch of privately-burned DVDs of serials from a dealer on eBay, along with several others I’ll be writing about this summer. The transfer is pretty raw, but the price was right. 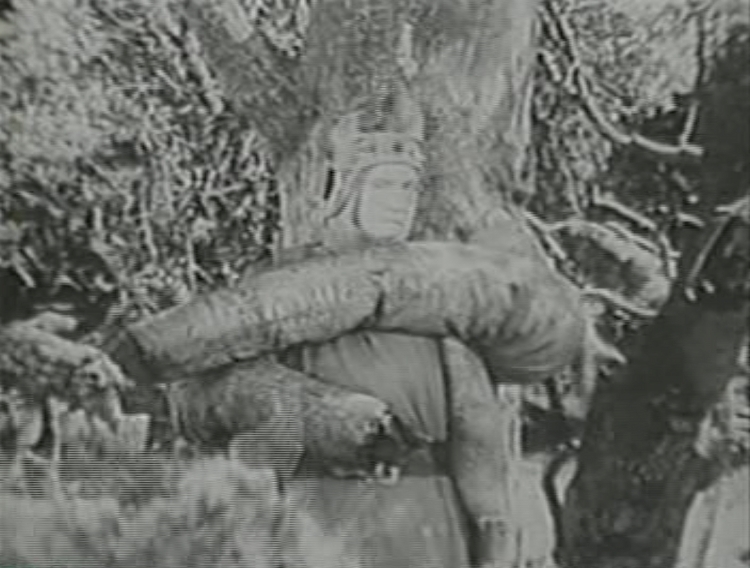 The Adventures of Sir Galahad doesn’t appear to be available to view online. Best Chapter Title: Not since The Perils of Pauline has a serial emphasized the perils of its cliffhangers this much: in addition to “Passage of Peril” (Chapter Six) and “Perilous Adventure” (Chapter Eight), there’s my favorite, “Castle Perilous” (Chapter Twelve). Best Cliffhanger: At the end of Chapter One (“The Stolen Sword”), Morgan le Fay has directed Galahad to find answers in the Enchanted Forest; this is Merlin’s domain, from which no man has returned. As Galahad and Bors enter, they are accosted by strange voices and sounds. Merlin appears and bewitches Galahad so that he can’t move; then Galahad is grabbed by a suddenly mobile tree, while flames dance around him. It’s a pretty intense and strange cliffhanger that lets us know we’re going into the deep end of fantasy here. Alas, my hope that all of the cliffhangers would be magical or fantastic wasn’t lived up to. Some are, and there are a few medieval-specific cliffhangers, like one in which Galahad is strapped down beneath a swinging spiked ball, à la The Pit and the Pendulum; but most are the typical falls or brushes with death common to all serials. But man, that first chapter: it’s a doozy. Bors: Have you never heard it said that rashness is the father of disaster? Galahad: True, but too much caution is the blood-brother of cowardice. What’s Next: X marks the spot! Join me next time for the generically-titled Pirate Treasure.